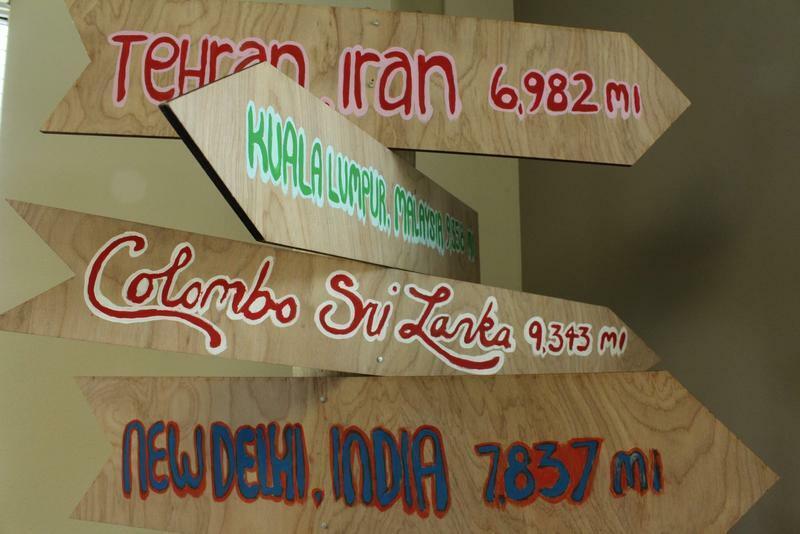 A signpost at Wichita State University signifies the direction and distance of the home countries of some of the university’s international students. Tat Hidano still gets the usual questions when he’s overseas recruiting international students to Wichita State University. The big one: Where is Wichita? But lately Hidano has been hearing another question: Will I be safe in the United States? “The questions about safety in the United States have been dominant,” Hidano said. He says his job has begun to feel less like recruiting and more like diplomacy. 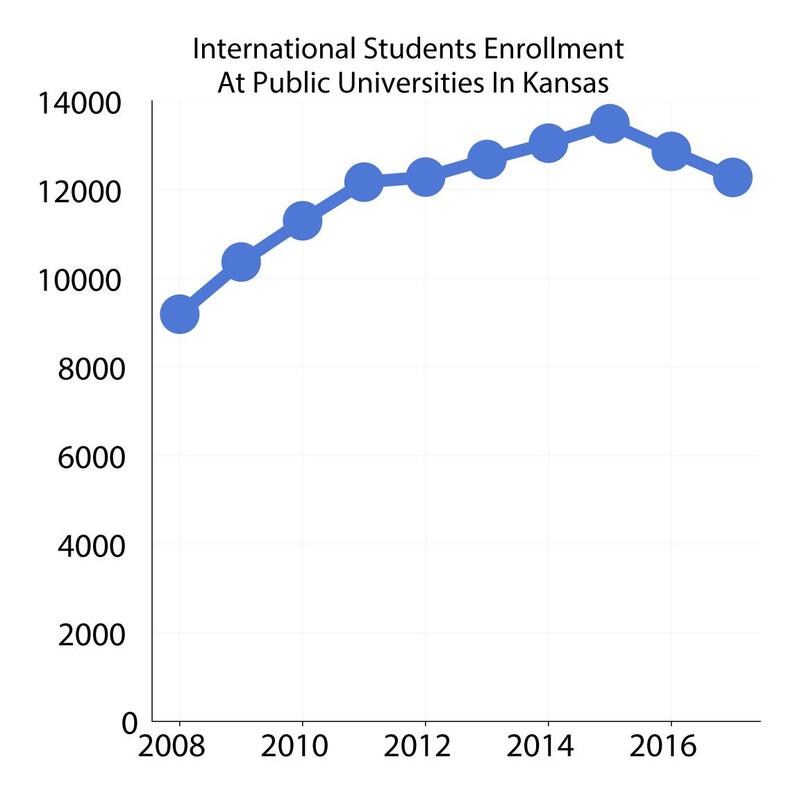 Universities across Kansas saw enrollment by international students — who often pay higher tuition — drop significantly last year, placing a further strain on already tight higher education budgets. At Wichita State, a 10 percent drop in the number of degree-bound international students on campus last fall left a nearly $1 million hole in the university’s budget. Excluding a brief period after the September 11, 2001, attacks, international enrollment in the U.S. has grown consistently for decades. Each year represents the academic year — for example, 2016 represents fall 2015 and spring 2016. SOURCE: Kansas Board of Regents. The decline is especially pronounced at Midwestern schools that lack the name recognition and appeal of more prestigious coastal institutions. "I don't think the NYU's and the Harvards and the Yales of the world have anything to worry about but it's other instutions that may not be as globally known," said Rajika Bhandari, head of research and policy at the Institute of International Education. New enrollments dropped about 7 percent for fall 2016 and universities reported that drop continued in fall 2017, though Bhandari says it's too soon to tell if it's a blip or a trend. Since the 2016 presidential campaign and the start of the Trump administration, some students appear to be thinking twice about studying abroad in the U.S.
“If you have an administration that is sending signals to immigrants within this country and sending an ‘America first’ message, which can be easily perceived as ‘America only,’ it’s not surprising that students are re-evaluating whether this is the place where they’ll be able to achieve their academic dream,” said Jill Welsh, the deputy executive director of public policy at the non-profit National Association of Foreign Student Advisers. Pooja Odedra came from India initially intending to study at American University in Washington, D.C., and then transferred to Butler Community College — partly because tuition at the two-year school near Wichita was cheaper, but also because of the harassment she says she experienced just walking down the street in Washington. Odedra says Kansas has been kinder, but comments like, “you don’t deserve to be here” and “you’ll be sent back soon anyway” have stuck with her. “It does make me feel insecure and question if I should be here, if some other country would be better,” she said. Odedra is still interested in working in media in the United States, but she is concerned about whether she would be able to get a work visa. There are still well over 1 million international students in the United States — many more than any other country. “Students still see (the United States) as the best choice for themselves in terms of obtaining a world class, top quality higher education,” said Rajika Bhandari with the Institute of International Education. At the same time, Saudi Arabia and Brazil have have reduced state-sponsored scholarship programs, leading to fewer students coming to the U.S from the two countries. Also, higher education offerings in other countries have become more competitive, giving foreign students looking to go abroad more options and encouraging others to study domestically. “There’s been a concern for more than a decade about increasing competition from abroad for the best and brightest,” Welsh said. 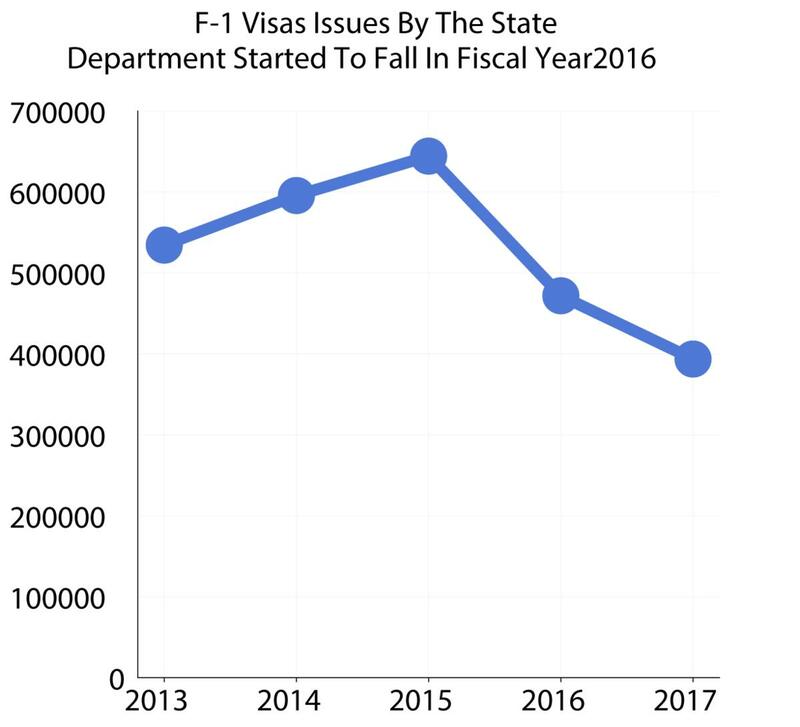 The number of F-1 student visas issued by the U.S. State Department has dropped by about 27 percent in fiscal year 2016 and continued to decline during the first year of the Trump administration by another 17 percent. The State Department doesn’t break down the data, so it’s unclear to what extent that’s due to a drop in applications. But there does appear to be an increase in visa denials. "For Spring 2018, we had a much larger number of students that were denied visas,” said Vince Altum, the executive director for international education at Wichita State. Altum says he’s heard from other recruiters and students from places like India and Sri Lanka indicating that the number of visa denials may have doubled. Odedra had her visa interview a few days after the 2016 presidential election. She says several friends and acquaintances of hers have since been denied. “A high school friend of mine was going to come here (to the U.S.) but then he decided to go to Australia because already quite a lot of our friends were rejected,” Odedra said. Many American universities tout the benefits of having a more global campus, but there’s also the money from tuition. 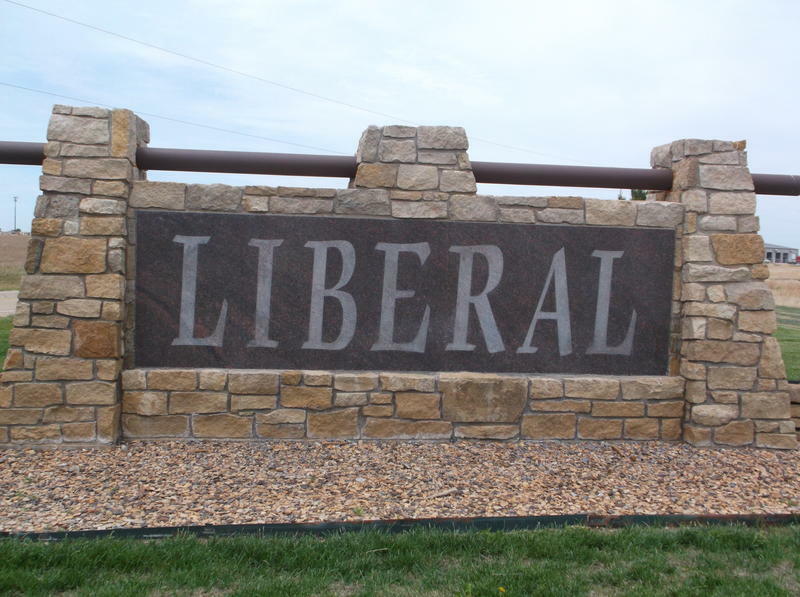 The Kansas Legislature did restore some funding to higher education this year. But while public universities in Kansas arehaving to make up for years of dwindling state resources and are struggling to grow enrollment, international student tuition is especially important. International students pay a lot more than in-state students. At Wichita State, tuition and fees are more than double for international students — about $8,500 a semester compared to $4,000. 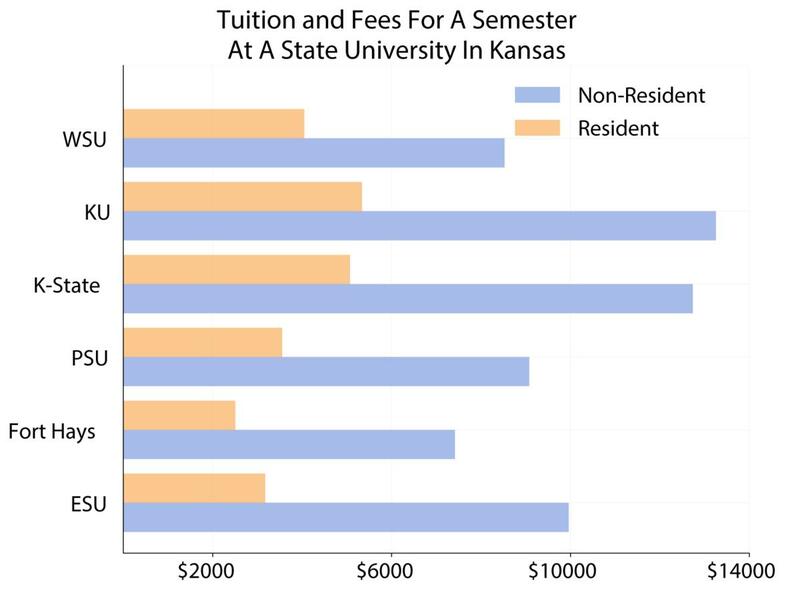 Tuition and fees for a semester as an undergraduate in Kansas can be as much as three time more expensive for out-of-state and international students. SOURCE: Kansas Board of Regents. Altum and his recruiting team are spending more time visiting community colleges, including Butler Community College, to entice students into continuing their education at the four-year institution. Wichita State recruiters have also visited community colleges out of state, in Dallas and Seattle. Spending a day at a community college that may have only five or six international students is worth it, says Altum, because those students have already had their visas approved. The university recently reduced international tuition by a third for some qualifying international students to draw in more recruits. And the effort has prompted a big spike in the number of applications coming in — Altum is seeing about twice as many applications coming in compared to this time last year. “These scholarships are giving us a glimmer of hope that we didn’t have last year at all,” Altum said. Normally at this time, universities would be moving on from fall admissions and shifting to the next recruitment cycle. But Wichita State has extended its recruitment season for fall 2018 in an effort to keep international enrollment from sliding further. “At this point I’m hoping to at least maintain the students that we have,” Altum said. Stephan Bisaha, based at KMUW in Wichita, is an education reporter for the Kansas News Service, a collaboration of KMUW, Kansas Public Radio, KCUR and High Plains Public Radio covering health, education and politics. Follow him on Twitter @SteveBisaha.